Anyone who has lived around London will probably recognise the name Truman. It still decorates pubs all over the city, the legacy of Truman's Brewery, one of the great 19th century London brewing companies – and for a short while in the late 1800s, the largest brewer in the world. Truman's was one of the victims of the British brewery mergers of the 1960s and 70s, murdered by Grand Met following a vicious battle with Watney's. Its huge brewery on Brick Lane closed in 1989, and although many of the buildings survive they now house all sorts of start-up businesses and shops. But in 2010, the name was revived, bought from Scottish & Newcastle (which had been left holding the parcel when the merger music stopped) by two Londoners who wanted to bring it back to the East End. When I read last year that they were building a 40-barrel plant in Hackney Wick – for a start-up, when the norm is more like 10 barrels! – it would have seemed like extreme hubris if they hadn't spent the intervening years proving the market by brewing and selling beer, first brewing at Nethergate and then when its capacity was insufficient, at Everards. 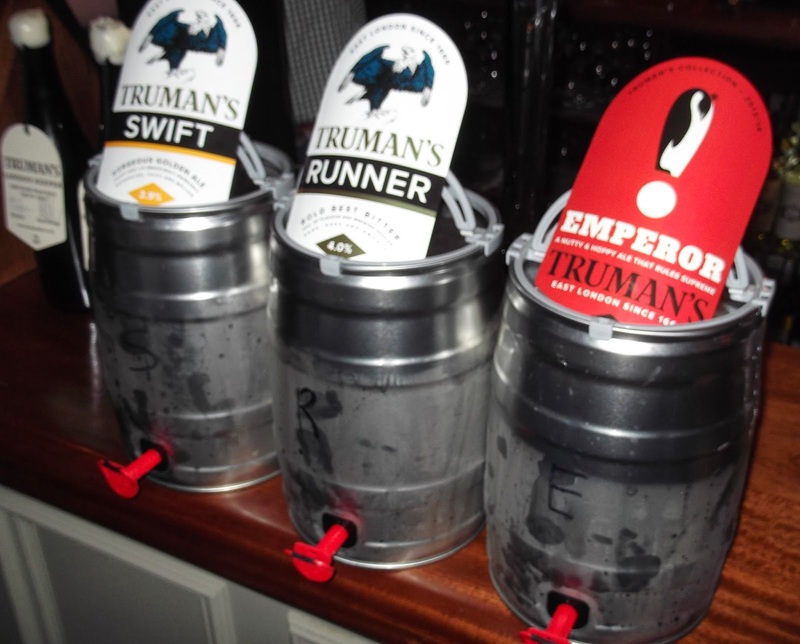 Truman's Runner is the new – sorry, re-established – brewery's flagship, but Paul says they are going straight into offering a range of three regular beers, with four seasonals, plus occasional one-offs as well. A classic 4% brown bitter, Runner was on tap alongside Swift, a clean, crisp and well-balanced 3.9% golden ale with Cascade and Saaz hops. The third regular will be Eyrie, the recipe for which isn't final yet, but the plan is for a best bitter of around 4.5%. The current seasonal was on tap too – Emperor, with a penguin logo, is a brown ale – American Brown Ale style, says the brewery, but I'm not sure it's hoppy enough for that – featuring the original Truman's yeast plus Cascade and Aramis hops, the latter being a French variety that's new to me and I suspect to most people here. It's very nice – fruity, with hints of coffee and a little chocolate. Confusingly though, while the recipe is new, the name isn't, as Truman's did a bitter called Emperor two years ago – this is not the same beer! Holding the banner for the occasionals was Truman's Original Porter. Made from a mostly brown malt grist in the old style London Porter, this is chocolately yet quite light bodied despite its 4.6%, and was sadly the least impressive of the beers on offer. 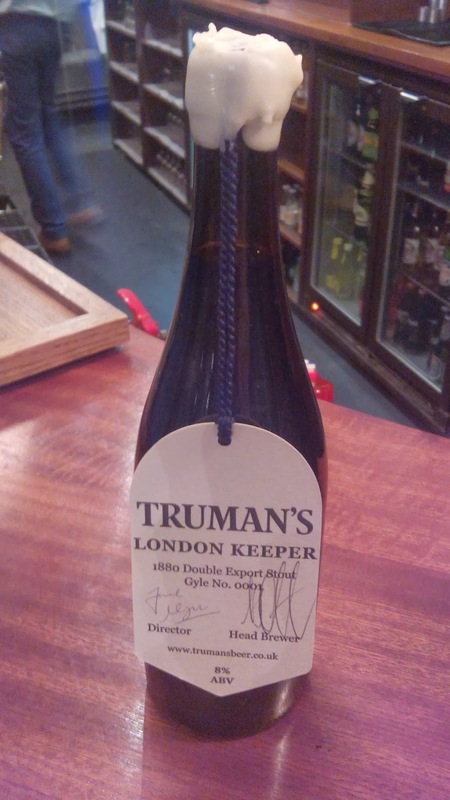 Paul had also brought along some Truman's London Keeper 1880 Double Export Stout, a limited edition of 2000 bottles priced at £17.50 each. Every bottle is sealed with ivory wax and bears a hand-printed, hand-signed and numbered label from a specialist craft printer also in the East End. A publicity stunt to help publicise the new brewery, where this was the very first brew on the new brewkit? Absolutely, but not just a stunt – the 8% beer is based on two recipes in the Truman's archive, and is hugely rich with umami dryness, cocoa and treacle notes, and an earthy bitterness. Somehow reminiscent of a Dunkel Doppelbock, it should indeed improve with keeping. An interesting aside was that Paul said the Truman's seasonals will all be 4.2% ABV. This is to make it easier for SIBA to list them as pubco guest beers – they will appear as a single entry, and the publican will get whichever one is current. I heard the same story from the guys at Twickenham Fine Ales a couple of months back (their seasonals are 4.4%), so I suspect we will notice a lot more of this tactic. All in all, Truman's is a great addition to the London brewing scene, and has already done a good job of getting its beers embedded on bars and its name back in the pubic eye. It's certainly one I'll be happy to see on a bar in the future. Last autumn, Truman's were running a "taste test" in Nicholson's pubs, between two beers, UK Gold 4.3% and US Pale 4.6%. The idea was that drinkers could choose which of these beers they liked best, and then vote for their favourite on-line. The trouble was I never saw them on sale side by side, and by the time I tried the second I'd forgotten what the first tasted like! Have to say they were both good though. Paul did mention that "taste test", I think he said the result hasn't been announced yet. But it does seem a bit odd if you can't compare the two directly!